Make no mistake, surfing is easier if you start as a fearless, flexible, nimble 13-year old. It’s just a fact. However, I am here to tell you that it is not impossible to start later in life, develop mad skills, and get totally hooked on surfing. It happened to me at the tender age of 40! After playing tennis for 32 years, my knees started to give out and I had to find a new sport. My natural love of the ocean, and a lifelong curiosity about ‘wave riding’ (as the Hawaiians called it) -- drew me to right to surfing. It’s now six and a half years later, and I am a different woman because I am a surfer. I left New York City after living there for 20 years and moved to the beach in Long Island. I quit my 9-5 job, rearranged my work life completely, and have figured out a way to live in Honolulu for four months each winter. More than anything else, surfing has taught me to F L O W better through life. Trading in high heels for flip flops has a freeing effect on a girl and all those things that you deemed so intensely important before, seem to peel off like a beautiful, long wave. So, if you are ready to surf (!) here’s a ‘must-do list’ I wish someone had given me when I started out. -GO FOR IT. No matter what, if you want to try surfing –definitely go for it. Statistically speaking, not many women have the desire (or the balls) to surf. So by wanting to try it—you are already half way there. Don’t let your fear or negative thoughts dissuade you. You might as well start being a Water Warrior right now. -VOW TO BECOME A GREAT PADDLER. Surfing is a lot about paddling which is a lot about upper body strength. The best women surfers have amazing paddling skills. Anything you can do helps upper body strength. Work out with light weights, swim, push ups, pull ups, any of it all or all of it will help. The longer you can paddle without getting tired, the more waves you catch and the longer your sessions can become! -YOGA HELPS. The other part is that surfing is about balance and some flexibility. I find my yogi friends catch on and get up faster initially. That’s not to say that if you don’t do yoga you won’t be able to surf—it’s just going to be easier if you do. One of the coolest yoga studios I ever went to was in Santa Monica where all the surfers would come in right out of the water--sandy, and with dripping hair, --prop their surfboards against the wall and unroll their mats. Many pro surfers do yoga and consider it the ultimate complimentary activity to surfing. -DON’T RUSH OUT AND BUY A BOARD TOO FAST. There are so many types of boards out there. You really need to try as many different boards as you can. Most likely you will be starting out on a long board – so try them all. Fiberglass and epoxy, soft boards and soft tops, nine feet and ten feet, thick and thin, etc… After a while you will start to get the hang of what works best for you and what helps you catch the most waves. -FRIENDSHIP STARTS AT THE WET SAND. I heard this gnarley dude once say that for guys who surf – friendship STOPS at the wet sand. For women – it’s completely opposite. We are natural nurturers, “includers,” and cheerleaders and we do really well with each other in the water. Stay positive, stay enthusiastic, be a safe and mindful surfer, and HAVE FUN !!!!!!!!!! 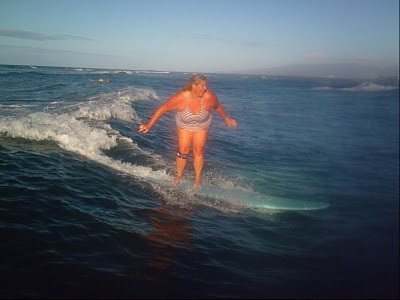 Cat is currently enjoying the New York winter surfing the South Shore of Oahu daily!